These were so much fun to make and the kids pitched in with rolling them into their shapes! In a large bowl, combine 2 cups flour, sugar, yeast, salt, minced onion and spices. Add water. beat just until moistened. Stir in enough remaining flour to form a soft dough. Turn onto a floured surface, knead until smooth and elastic, about 4-6 minutes. Cover and let rest for 10 minutes. Divide dough into 16 equal pieces, roll each into a 15 inch rope. Cover and let rest 10 minutes longer. 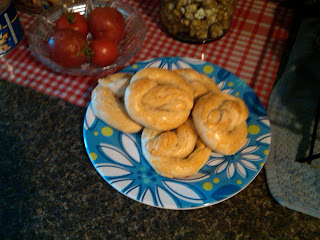 Twist into pretzel shapes. Place on greased baking sheets, brush with egg. Bake at 350 degrees for 15 minutes. Brush again with egg, sprinkle with coarse salt. Bake another 10-13 minutes longer or until golden brown. Remove to a wire rack to cool. I stored half of the pretzels in the freezer and we ate the others with a cheese dip. These are such a yummy treat just by themselves, or to eat with a nice southwest soup. Oh yum. I would like to come over and enjoy with you guys. I'll have to show this one to Luke, he loves baking breads, and I think he would love to give this a try. Did the boys like helping? Did they like the outcome? I love your new format, it is so cute Amy. Also, that "cooking up some love " picture is great. I was planning to make pretzels this week! What a great twist on the original! OH my WORD so yummy!! I love how you added the onion and spices. Makes a great guys kinda snack! 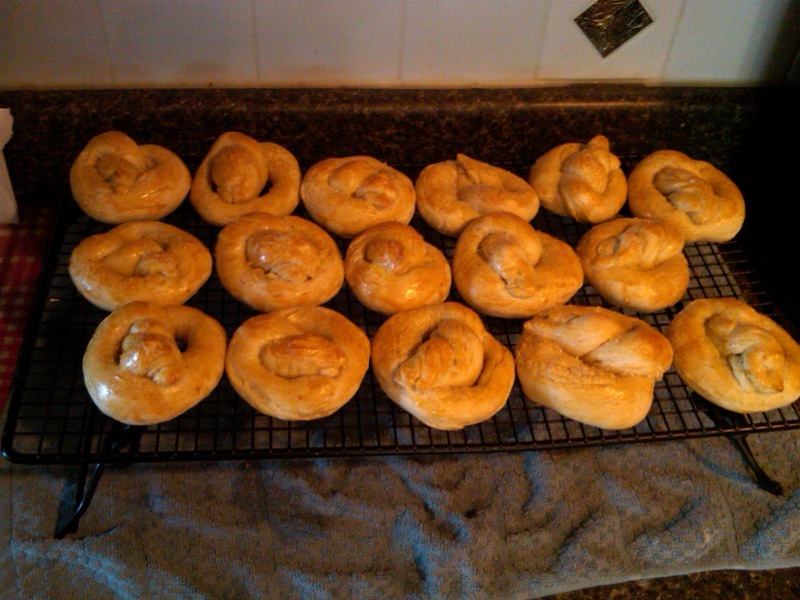 The boys did such a great job twisting the dough too! You are such a delight Amy! I am greatly anticipating and wondering what your next recipes will be! !